UK law requires public services to make reasonable adjustments for disabled people following the Disability Discrimination Act (1995) and the Equality Act (2010), which does not cover Northern Ireland. For people with physical disabilities these have predominantly focused on the environment, whilst for people with a learning disabilities it requires more commonly clear explanations and accessible information, assistance with appointments and managing issues of consent. Since 2008 adults with a learning disability have been able to have annual health checks with their general practice if their practice is participating. The Public Health Learning Disability Public Health Observatory (LDPHO) was previously called Improving Health and Lives (IHAL) Learning Disabilities Observatory and was set up in 2010. The LDPHO collect, collate and monitor public services for people with a learning disability. This report was one of a series LDPHO’s reports focusing on reasonable adjustment in specific service areas. The investigators contacted people and professionals working with people with learning disability in England through Janet Cobb’s email Network for examples or reasonable adjustments they had made to general practices to increase access for people with learning disabilities. In addition they reviewed websites for further examples. There are 3 appendices, which update the systematic review of the evidence concerning the impact of health checks on the health and wellbeing of people with Learning Disabilities published by LDPHO in 2010. There are case studies and examples of reasonable adjustments from 11 organisations across England and one from a carer. The common themes appear to focus on providing general practices with resource packs and engaging with training of practices using facilitators. Uptake of annual health checks in England has been increasing gradually to 92,329 in 2012-13 (52% of adults on GPs Learning disabilities registers). The review of published evidence showed that health checks consistently identify unmet needs in 51% to 94% of adults, though there is no good evidence about how much improvement in health outcomes is achieved in the short to long term. There is some limited evidence to suggest that identifying and treating health problems in people with learning disabilities stops or reduces behaviours that challenge. The majority of people with learning disabilities and their carers think health checks are a good idea and are acceptable, but barriers to access worsen some people’s concerns. General Practitioners are becoming more favourable to the idea of health checks, though there are a range of views from positive to skeptical. This report is trying to identify reasonably adjusted general practice services for annual health checks for people with learning disabilities. There are problems with this approach as adjustments may be specific to an individual and several adjustments may be required in order to remove or reduce a range of disadvantages for an individual patient or their carer. How do we know if an adjustment is effective? Most of the case examples are provided by the services who instigated them and do not appear to include significant evaluation. However, this approach of collating reasonable adjustments particularly in the IHAL database does highlight potential adjustments. 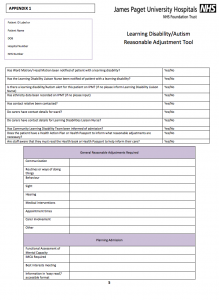 I wonder whether a reasonable adjustment checklist for children and adults in general practice might be useful, similar to the example from James Paget Hospital, with some feedback from patients and their carers on their effectiveness. Making Reasonable adjustments to primary care services- supporting the implementation of annual health checks for people with learning disabilities (LD), Kenney A, Turner S, Glover G and Hatton C, Public Health England, 2014. 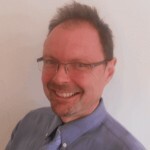 Dr Matt Hoghton is a General Practitioner in North Somerset and a Visiting Fellow in Social and Community Medicine at the University of Bristol. He is Medical Director of the RCGP Clinical Innovation and Research Centre. He was the RCGP Clinical Champion in Learning Disabilities 2010-13 and the Lead Investigator in the Confidential Inquiry into the Premature Deaths of People with a Learning Disability (CIPOLD).